DescriptionThis species is named after the male butterfly who has an orange colouring at the wing tip. Both male and female can be identified by the mottled greed pattern of the underside of the hindwing. Common throughout the lowland of England and Wales and rarer in Scotland. 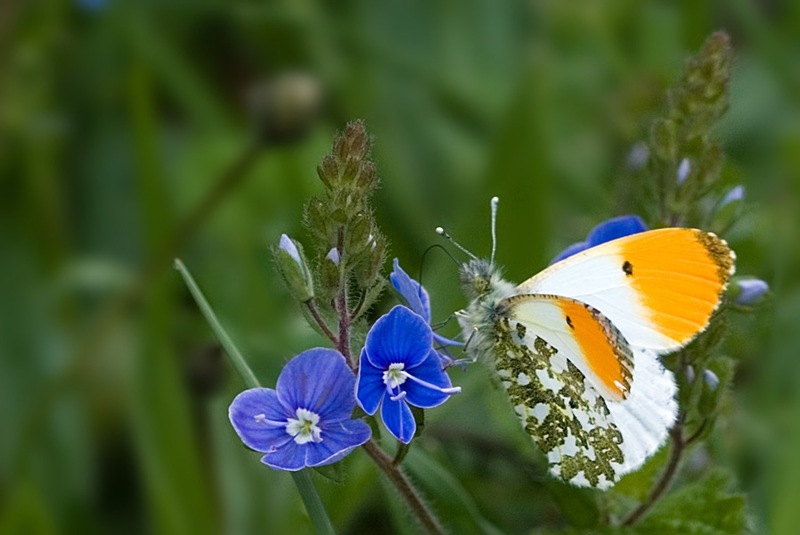 Males are a common sight in spring flying along hedgerows and damp meadows in search of the more reclusive female, which lacks the orange tip and is often mistaken for one of the other 'White' butterflies. Eggs are laid on cuckoo flower or garlic mustard. This butterfly overwinters as a chrysalis and emerges some 10-11 months later. The flight period is from early April to mid-July. Mainly the flowers and seedpods of tall Crucifers – Lady Smock/Cuckooflower (Cardamine pratensis) and Garlic Mustard (Alliaria petiolate). Garden plants such as aubrieta, forget-me-not and honesty attract the adult butterfly. Damp pastures and meadows, damp woodland edges, glades, riverbanks, ditches, dykes, fens, railway cuttings and country lanes.